How does HR strategy actually drive business growth? Asia’s top-notch HR leaders and talent strategy specialists will demonstrate the answers at Talent Management Asia 2018. Talent Management Asia, the region’s premier human capital strategy conference, is back to examine the latest developments, concepts, and best practices in the form of case study presentations, panel sessions, and interactive roundtable discussions. Organised by Human Resources, Asia’s only regional HR media & events brand, Talent Management Asia is a two-day conference happening in Singapore, Malaysia, Hong Kong and Philippines. 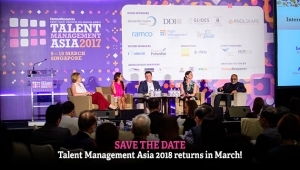 The Talent Management Asia 2018 agenda will explore the link between human capital management and business growth and cover talent acquisition, employee engagement, performance management as well as the latest trends in the use of HR technology for people processes.